Likes: Oats, cilantro, oats, carrots, oats, petting, oats, power napping, and oats. Anything on the floor is fair game for bunnies! Likes: Playing with his Chinese yo-yo, sneaking into empty grocery bags, jumping onto my shoulder for a panorama view of the room, and curling up in the bathroom sink to watch me get ready in the morning. Pay attention to me now! Likes: Living securely indoors; dining on a regular basis in a climate controlled environment; sleeping on a human chest. 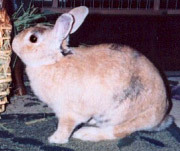 Breed: Feral Armenian short hair – if such a breed exists. Likes: Being very close to people, especially her human mom and dad. Eating freshly cut tomatoes and Russian canned salmon with tomato sauce. Sleeping on top of the convertible’s rag-top. Playing with rolled-up socks. I am human – hear me roar. Likes: Running around the apartment; sleeping under the dining room table; chewing paper, books (he has his own now), the couch, art work, everything else within reach; being petted, cuddling and nuzzling under my chin; nesting in his hay; and his Sit-A-Pet sitter, Evelyn. And Simon will do anything for an organic banana chip! Breed: Some say I’m a Rat Terrier, but I consider myself a star! Likes: Being recognized as the regal ruler of the household; sleeping in front of the heating vent; sleeping anywhere; eating treats like shrimp; eating generally; scratching pads of all sizes and shapes; drinking out of the bathtub faucet; affection from her favorite people (including Tammy and Kate from Sit-A-Pet); shedding, especially on anyone wearing black. Likes: Sleeping on the air conditioner vents; riding in the car; mud puddles; walks; chasing balls and squirrels; swimming; belly rubs; humans of any size; food items of any kind; sleeping on his back on the couch with four paws in the air; having his ears rubbed; chewing sticks; writing his new novel. Likes: Playing, flying, walking, taking, imitating every sound, getting his head scratched, lying on his back and having his belly rubbed. Pupi is a pretty bird!